14 Surgeons, including 3 staff surgeons and 11 residents. The Laparoscopy Course included lectures, inanimate skills laboratory, and live surgery over 4 days. Lecture content included the history of surgical innovation and teaching at Hopital de Bienfaisance, history of laparoscopic surgery globally, safe and effective use of laparoscopic instrumentation, a variety of general and gynecological surgical procedure lectures utilizing minimally invasive techniques delivered by all members of the Haitian and American faculty, and 2 new SAGES lectures on the Fundamentals Use of Surgical Energy (FUSE), given in both French and English. Flash drives containing all lecture materials were provided to each student. New iPad-based trainers were implemented successfully in the Inanimate Skills Laboratory. The SAGES Fundamentals of Laparoscopic Surgery (FLS) program was utilized as the basis for the lab. An ultrasonic energy lab was also conducted, which provided hands-on experience for all students with this newer technology. The annual Endo Olympics competition was held with spirited camaraderie among the participants. Surgeries included 7 lap choles, 2 laparoscopic Toupet fundoplications, and 4 diagnostic laps with surgical intervention for infertility. 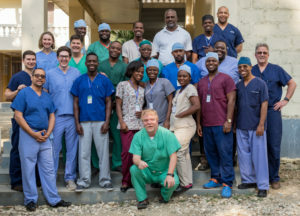 The last 2 lap choles were conducted with 100% Haitian staff, including Dr. Sylvio Augustin as the lead surgeon, 2 residents assisting, along with anesthesia and a surgical tech. The last procedure was completed utilizing the ultrasonic energy device exclusively, marking a new first for the Haitian staff. Dr. Paul Severson and Dr. Andrew Loveitt joined Dr. Sylvio Jr. Augustin and performed 3 laparoscopic cholecystectomies, utilizing the laparoscopic equipment donated to the hospital by Project Haiti in 2017. The cases were performed skillfully by Dr. Sylvio Augustin as the primary surgeon and we found the equipment well cared for and in excellent working condition. We were greeted by urologists Drs. Bernard Brutus and Youry Dreux, who were performing surgery for stone patients in the next room. Dr. Paul Severson and Dr. Andrew Loveitt were invited to meet the residents and faculty at La Paix, and were picked up the Le Plaza and escorted by the Chief of Surgery Dr. Nesly Vastey to Hopital L’Universitaire La Paix. All the residents and some of the faculty gathered to meet us and after bilateral speeches, we evaluated the existing laparoscopic equipment and then toured the facility, including the operating rooms. There may be 2 surgeon champions at that residency program, one general surgeon that attended our course in Pignon, and also a pediatric surgeon with some prior laparoscopic experience in his fellowship. We made plans to invite both faculty and residents at our next course, and will consider developing another laparoscopic site there in the future.